When Harry G. Lang was a student at Western Pennsylvania School for the Deaf, he was interested in pursuing a scientific career. Curious, he searched for books about deaf scientists, and found next to nothing. Only later, after he had begun teaching, did he learn about the youthful British astronomer John Goodricke, who discovered the binary star Algol. Thanks to Lang, countless teachers and students now have easily-accessible information, not only about Goodricke, but also many others who made noteworthy contributions to the fields of astronomy, chemistry, bryology, medicine . . . all sorts of endeavors, including the arts. They were born deaf, early-deafened, progressively deafened, hard-of-hearing, and had one thing in common: they refused to be deterred. After graduating from WPSD, Lang earned his Bachelor of Science degree in Physics from Bethany College (West Virginia), his M.S. in Electrical Engineering from RIT, and his doctorate in Education from University of Rochester. Lang not only taught graduate students in NTID's Master of Science in Secondary Education program for 41 years, he has also encouraged deaf students to explore and pursue science-related careers. He has also made noteworthy historical and biographical contributions to the field of Deaf Studies, and continues to research and document the “forgotten” contributions of deaf scientists and mathematicians. This is an incomplete listing of Lang’s books: Silence of the Spheres: The Deaf Experience in the History of Science (1994), Deaf Persons in the Arts and Sciences: a Biographical Encyclopedia (with Bonnie Meath-Lang, 1995), Signs for Science and Mathematics: a Resource Book for Teachers and Students (1996), A Phone of Our Own: the Deaf Insurrection Against Ma Bell (2000), Educating Deaf Students: From Research to Practice (with Marc M. Marschark, 2001), From Dream to Reality: A History of the National Technical Institute for the Deaf at Rochester Institute of Technology (with Karen K. Conner, 2001), Edmund Booth, Deaf Pioneer (2004), Teaching From the Heart and Soul: the Life and Work of Robert F. Panara (2007), Moments of Truth: the Journey of Robert R. Davila, Deaf Educator (with Oscar P. Cohen and Joseph E. Fischgrund, 2007). In progress: Teaching Mathematics to Deaf Students (with Claudia Pagliaro and Christopher Kurz), Consider Him a Friend: Abraham Lincoln and Deaf People (with Michael Jones), and Deaf People and Deafness During the American Civil War. Lang’s books have become standard references and make absorbing reading. Silence of the Spheres, inspired by his encounter with renowned British theoretical physicist-cosmologist Stephen Hawking, recounts the achievements of dozens of deaf scientists through the ages. A Phone of Our Own tells the fascinating story of how a trio of deaf men, frustrated with the inaccessibility of the telephone, accomplished what the mighty and well-funded AT&T research labs could not (and would not). Ironically, they didn’t realize any profit from their invention, but had the satisfaction of knowing that they had started a technological and social revolution. Deaf Persons in the Arts and Sciences is an essential starting point for anyone doing historical research. Moments of Truth and Edmund Booth: Deaf Pioneer were chosen (respectively) for the National Literary Society of the Deaf’s “Deaf America Reads” 2008 and 2010 campaigns. Lang has also contributed chapters to anthologies, and articles to scholarly journals such as Journal of Deaf Studies and Deaf Education, American Annals of the Deaf, and publications by and for science and math teachers. He says: “When I look back at my 41 years at NTID, the number-one highlight was the beautiful bonds I had formed with my students. This was also evident when I received the honorary doctorate last month and three of my graduate students for whom I served as a thesis mentor surprised me at the ceremony. 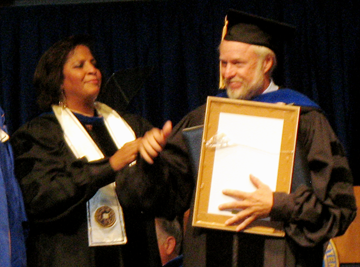 I [had not yet] seen any photographs of the honorary-degree ceremony from Gallaudet, but Gary and Jeannie Behm from NTID (I taught Gary in 1974), who were there for their son’s graduation, sent me some.